The final studio album by the Jimi Hendrix Experience gets the special reissue treatment to celebrate its 40th anniversary. Electric Ladyland was the third album by the band in quick succession, and when released in October 1968 was considered the crowning artistic achievement of the band. The LP included future rock classics Voodoo Child (Slight Return), Crosstown Traffic, Gypsy Eyes, and All Along The Watchtower. 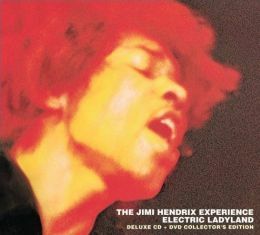 This year, the 40th Anniversary of Electric Ladyland, is being celebrated with the release of a CD/DVD issue of the album. It features an expanded cut of the documentary At Last … The Beginning: The Making Of Electric Ladyland on the DVD, alongside a remastered version of the album. The Electric Ladyland 40th Anniversary Collecter’s Edition is out next week in the US, but those in the UK will have to wait until January 5th. You can pre-order the album from Amazon here.